The Shaman Bottom Dual Coil Clearomizer is the latest technology in dual coil eGo clearomizers. It has a 3ml liquid capacity and will fit on any 510 threaded eGo battery. The dual coil clearomizer heads are replaceable. This means that once your wicks have burned out (wicks typically have a life of 14-21 days) you are able to replace the burned one with a new coil head. This bottom dual coil clearomizer has a classy, shiny appearance that is bound to attract attention as it is made of chromed brass. 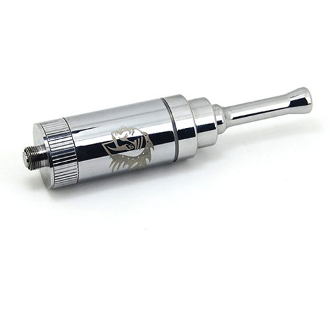 It has a long metal drip tip that screws onto the clearomizer. This means that you cannot use any other 510 eGo drip tip with it, but this feature gives you added durability. Unscrew the top of the clearomizer. Replace the top of your clearomizer and enjoy vaping. Unscrew the coil head with attached wicks. Replace with a new coil head. NOTE: ALWAYS keep this clearomizer AT LEAST ½ full or the wicks will become dry and can/will burn out.